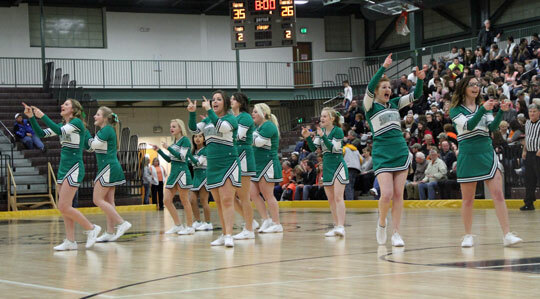 --After the Lady Shamrocks defeated Neelyville 42-34, advancing to Columbia for the third straight year, as they began walking off the court they stopped, turned towards Shamrock fans and their other teammates, as the New Haven’s Cheerleaders led everyone in the singing of their school song. We always ask the players “How does it feel to be going to state” but never think of asking the cheerleaders the same question. They practice all season long with the same motto of representing New Haven’s “Tradition of Excellence”. I spoke with two senior cheerleaders, Captain Madison Yarbrough, who will have been a cheerleader all four years and senior Megan Poe. 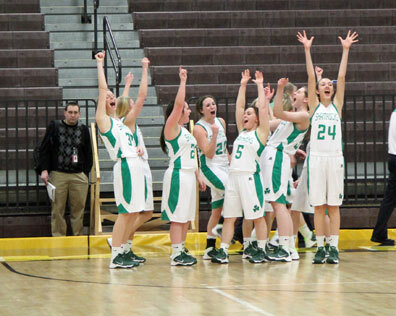 Lady Shamrocks cheer after singing school song. Being a cheerleader takes more work than they are given credit for. I’ll be the first to admit it. There is no way I could cheer for 32 minutes yet alone have the same amount of energy I began the game with. The title “Cheerleader” makes it quite obvious what their job is during games, lead fans in cheers, which is not always easy, particularly when your team is losing, but that never stops them from trying to get their team going. Both senior point guard Rachel Steinhoff and senior forward Emily Kallmeyer commented on how they get an extra boost when fans are going crazy and cheering them on. There’s no doubt that the Lady Rock’s “6th Man” are New Haven’s Cheerleaders and deserve to be recognized for all their had work in keeping Shamrock fans “fired up”. 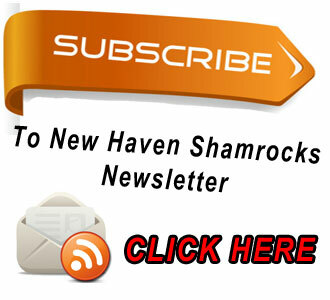 Video of the singing of New Haven's Alma Mater recorded by LuAnne Engelbrecht.